Whether you’re currently on a career break, in the throes of maternity leave or in a job that just isn’t ticking that flexible working box, we have the perfect event for you! There is no doubt that January is THE time of year to start thinking about making a change and starting your journey to Work That Works®. 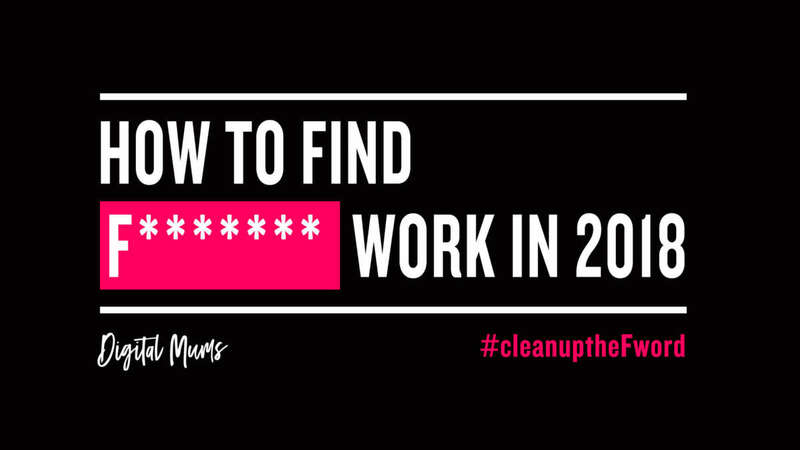 So as part of the next stage of our #CleanUpTheFWord campaign we want to invite you to an awesome event, in collaboration with LinkedIn, that is all about F******* Working. That’s flexible by the way. If you’re looking for advice on how to find the perfect flexible career in 2018 then this is the event for you. Expect an event literally jam-packed with practical tips. A session run by the experts at LinkedIn on how to make the most of career breaks on your LinkedIn profile to help find the perfect flexible job. There will also be advice on how to build your profile for freelance work right through to why you should start blogging on LinkedIn. A session led by Digital Mums on how to network using social media. Expect tons of confidence boosting tips that will help you to find the perfect flexible opportunities, regardless of how long you have been out of the workplace. Hear from three of our awesome graduates who will each share their top tips for finding Work That Works® and share what their work life looks like right now. Of course we’ll cover retraining here too! Plenty of opportunity to network and speak to all our experts on a 121 basis during our networking session. Liz previously worked in marketing for a travel company but was made redundant during maternity leave. Last year she spotted Digital Mums on Instagram and thought the Associate Programme would be the perfect opportunity to develop her marketing skills and work flexibly. She now has a successful career as a freelancer and works with a range of clients. Before completing our Social Media Management Course last year, Kay was a stay-at-home mum looking after her three children and working in various ad hoc/flexible roles. For her community campaign, Kay started Mums Without Limits, which aims to show all the the fantastic things mums can do besides being a mum. She still manages this account today, as well as doing social media work for a virtual PA company. Anna lives in Birmingham and is mum to two children, Martha and Olive. She worked in communications for 10 years and loved her job, but after having her second child found it difficult to manage work and family life. Last year, Anna completed the Social Media Management Course and added social media to her PR skills. She is now busier than ever working as a freelancer - but she also gets to be at the school gates every day. To secure your place at our event all you need to do is sign up here via Eventbrite. Places are very limited so sign up soon to avoid disappointment. We are expecting the event to be really popular so although free, please only reserve a place if you think you can make it on the day. And while of course there is room for babies in arms we’re sorry we won’t be able to accommodate toddlers.